Whilst some of you may have heard of the pastime of geocaching, others may not, so I’ll start my story with a wee definition to give you all some background. Geocaching.com, the hub for geocachers the world over, describes it as: “Geocaching is a real-world, outdoor treasure hunting game using GPS-enabled devices. Participants navigate to a specific set of GPS coordinates and then attempt to find the geocache (container) hidden at that location.” I have to say that I prefer the more frank description of “Using multi million pound technology to find tupperware in the woods”! Herder Eve delighted by finding her first geocache. I first started geocaching in the Lake district about 5 years ago, and became addicted enough to have now found nearly 1000 caches, right across the country. It is a great way to explore a new place – many people will set trails of geocaches that lead you round a route – and a great excuse to get people old and young out into the great outdoors. Whilst a lot of the caches that you come across are fairly mundane, there can be real surprises in them, and sometimes incredible containers – for example when the cache is hidden inside an old snail shell! Sneaky! 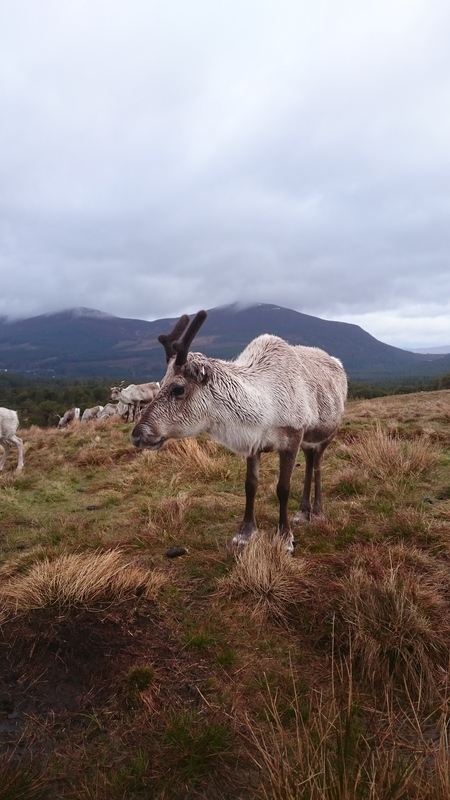 A few years ago, myself and fellow herder-and-geocaching-partner-in-crime Hen set out a trail of our own cleverly disguised caches starting at the Reindeer Centre in Glenmore. As the “owner”, it is our responsibility to maintain the caches in good condition. Checking the cache right outside the Centre recently, I was pleased to find what is known as a “trackable”. This is a small object with a unique code on it, so it can be looked up online. Trackables are often set a mission, for example to travel from one end of the country to the other, or to only visit caches near rivers. One cacher will leave it in a cache, and the next person to find the cache can choose to move it along to another cache. 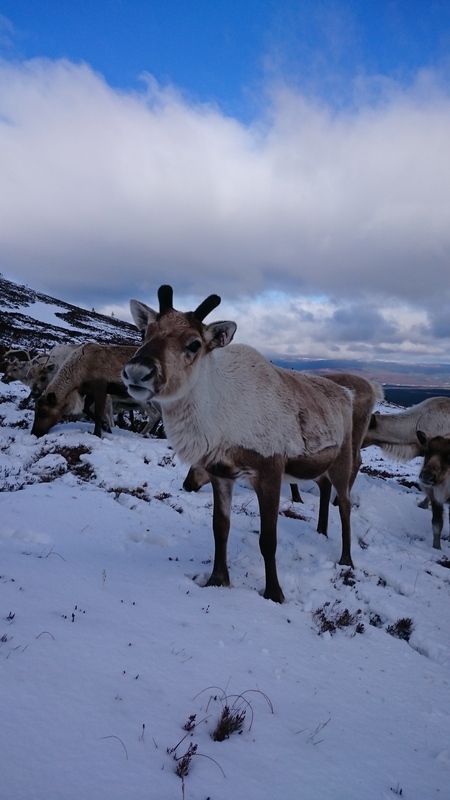 Cheese shows off how beautiful the Cairngorm reindeer are! 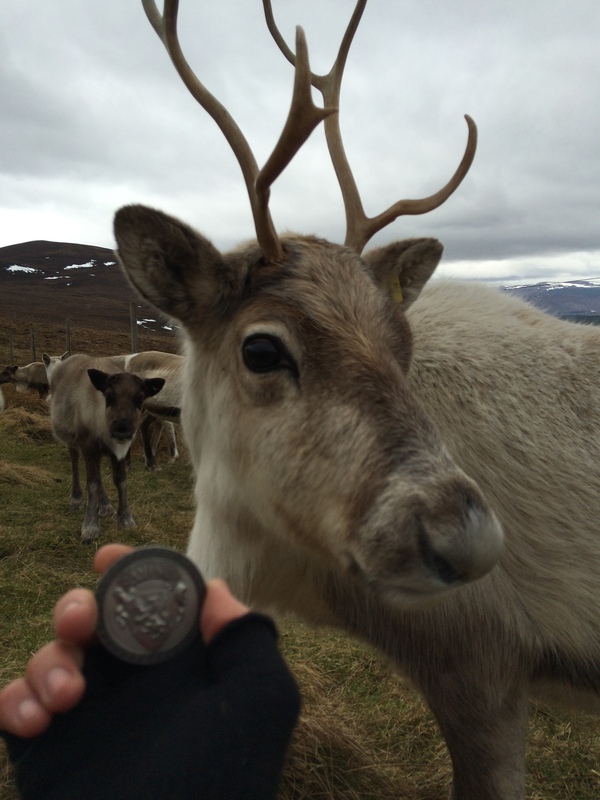 I was amazed to find that this particular trackable geocoin had been “released” in Germany almost 10 years ago, and was named “The Cairngorm Reindeer Centre Geocoin”. 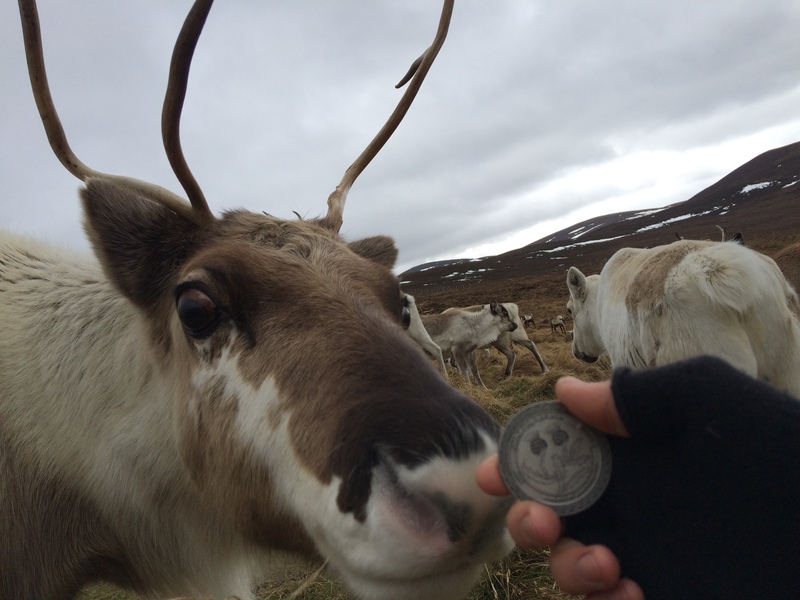 Its mission was to travel all the way to Scotland and meet the reindeer here. Unbeknown to me, it was enroute before I’d even heard of geocaching, and before there was a cache placed here at the Centre. 10 years is also an amazingly long time for a trackable coin to travel without getting lost or stolen. Gloriana and Cheese were more than happy to pose with the coin, which will soon be “released” to make its way back towards its owners in Germany. Let’s hope its run of luck remains for long enough for it to return safely home. It just shows that you never do know what surprises you may encounter. Now that I’ve revealed my complete nerdiness, if you’re inspired to try something new, have a look at www.geocaching.com and see what geocaches are near you – you’ll very likely find that there is one hidden on the corner of your street or in a local park, and anyone can get involved using a smartphone or GPS. Who can say no to a free treasure hunt??! 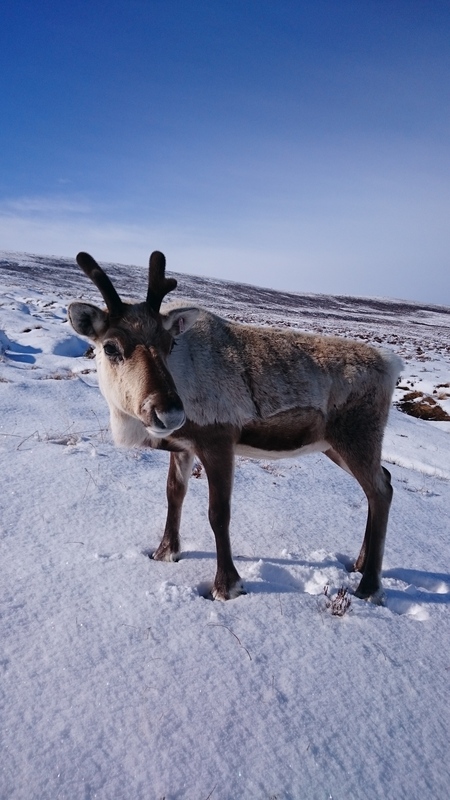 Some of you may already know this female reindeer, Ryvita. 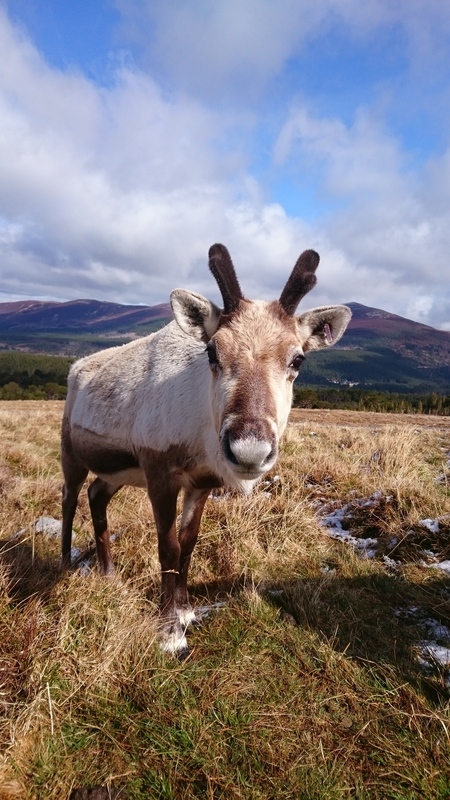 If you don’t then she is a 7 year old mature female who has a lovely nature and, like most the other reindeer in the herd, is super greedy! Over the past three years she has had her daughter Cheese by her side as she hasn’t calved since she had her in 2013, so the two of them are inseparable. Not sure what will happen if Ryvita has a calf this year… Poor Cheese! However this blog is not about the relationship between Ryvita and Cheese, it is about antler growth. Over the past month I have been taking photos of Ryvita to show you all how fast reindeer antler grows. Antler is in fact the fastest growing animal tissue in the world. I started taking my photos on the 17th April 2016 and took the last one on the 22nd of May 2016 and in that time I reckon her antlers have grown a good 8-10 inches and also a 4-5 inch front point, so it really is phenomenal. We think Ryvita is still due to calve so she’s also growing her calf inside her, and is doing a fantastic job of both. The photos speak for themselves so I hope you enjoy them. Note that we had snow, then a lovely sunny spell, then another good dump of snow again… Got to love an unpredictable Scottish spring! A few days later, the 28th of April, and we have snow! Bit of a damp day, May 2nd. Ryvita on the 8th of May, I think she’s bored of being our model! 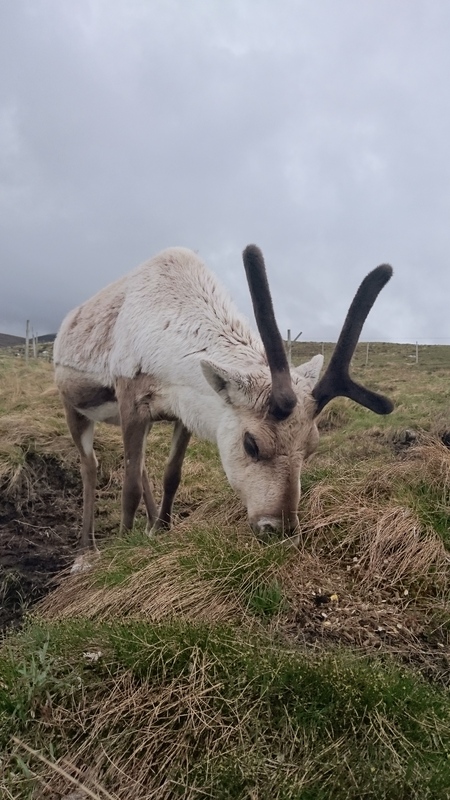 Ryvita’s antlers will continue to grow until the onset of autumn, so hopefully she gets lots to eat and she will hopefully grow a rather lovely set of antlers. No job with animals is entirely “9 til 5”. As reindeer herders, we normally work from 8am to 5pm. In calving season, however, this becomes rather more flexible. When cows are ready to give birth, they tend to head away from the herd to find a nice secluded spot, which in our 1,200 acre enclosure means they can vanish! Every time we feed the herd, we do a head count to check if anyone is missing, work out who they are, then someone will be dispatched to walk round the enclosure looking for them. This means we can hopefully find them not too long after they’ve given birth, check the calf over, spray its navel and put a drizzle of insecticide on their back to protect against ticks. 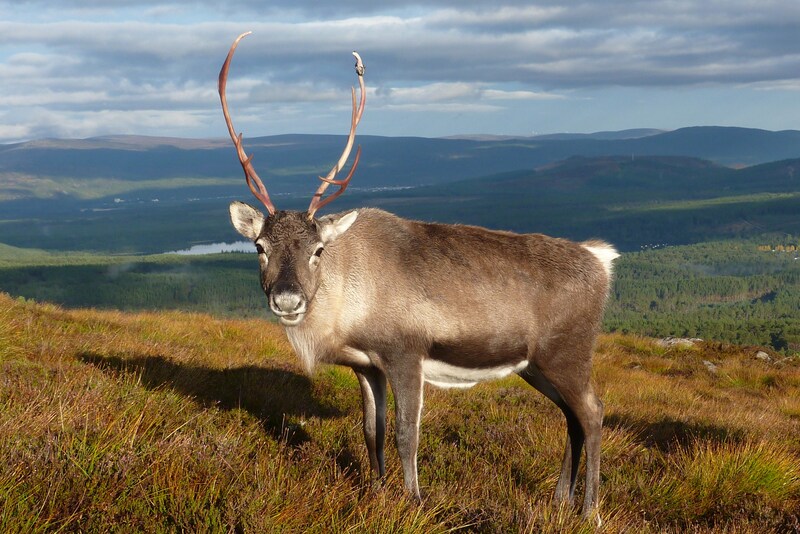 If a reindeer heads off at the morning, this is easy – a herder will walk out. 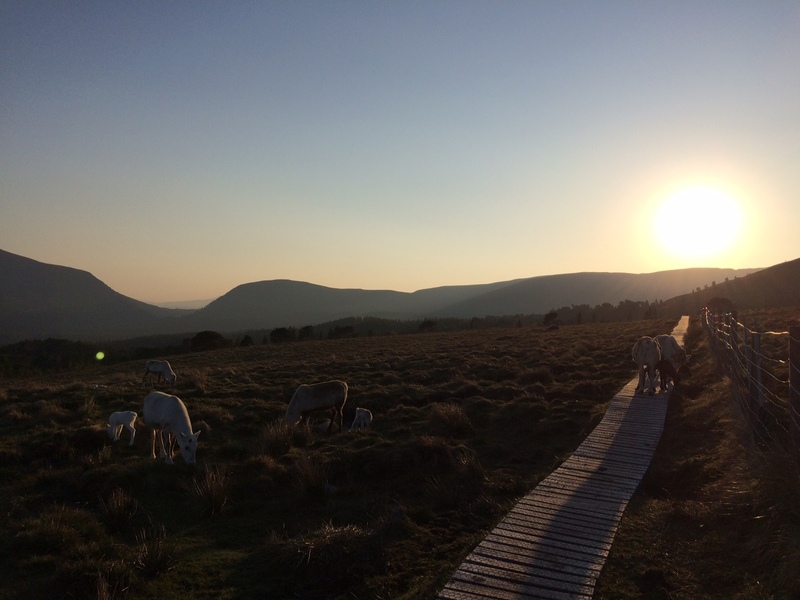 But if a cow is heading away in the afternoon, we take turns to do an “early” – basically starting at the crack of dawn to give ourselves the best chance of an unhurried search of the enclosure. 5am: Painful as it is, the alarm clock buzzes me out of slumber, and I get up and ready quickly, putting toast on and making up a flask of coffee to take with me. I’m entirely dependent on caffeine, especially when I’m awake unsociably early. 5.15am: Out of the door and on the short commute to Reindeer House. This early in the morning it seems that the rest of mankind is still asleep – all I see are numerous wood pigeons (who seem to love sitting on roads in the early morning) and a roe deer buck. 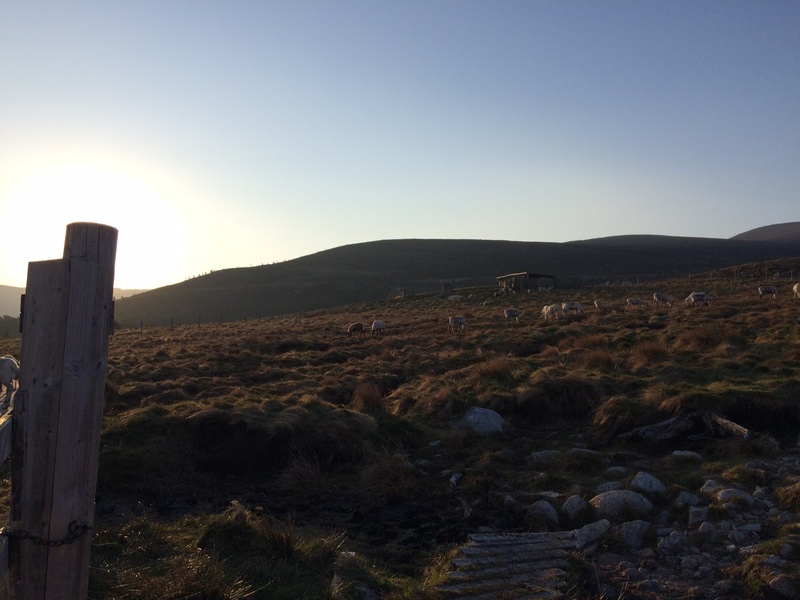 5.30am: Arrive at Reindeer House and swap into the work van. The night before it was prepared with reindeer feed, binoculars and the all important “baby bag” – stocked with lichen, reindeer food, headcollar, antiseptic spray and emergency chocolate. I then drive round the mountain road – it gives a good view across to the enclosure and a bit of an advance idea of where missing reindeer may be hidden – anything to make it a bit less “needle in a haystack”. 5.45am: Shoulder a sack of feed and the baby bag, and walk up to the enclosure. The sun is just coming up, the woods are alive with birdsong, and the day is already warming up. 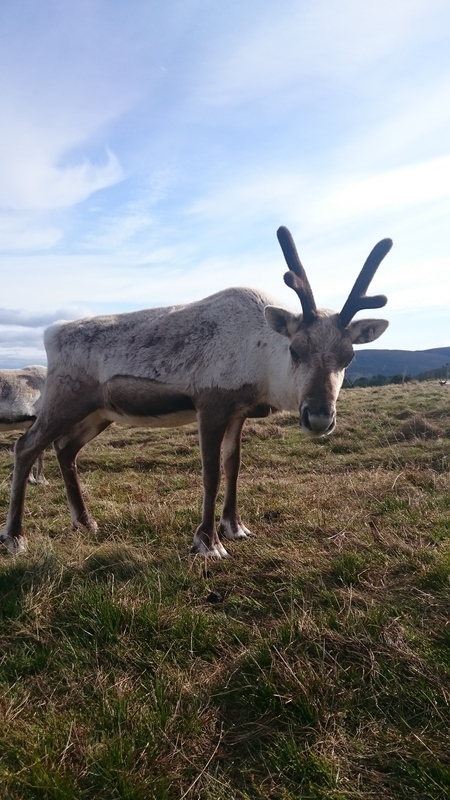 Whilst some of our reindeer cows calve out on the free-range, we use the enclosure for most of them as it provides a safer environment (away from dogs) and means we can keep a bit of an eye on them. They are great mums and rarely have any problems, but just on occasion we can give them a helping hand. 6am: Most of the herd are already waiting at the gate, back from their night of wandering, aware that we are on “calving time” and there is a chance an early breakfast may be on offer. I let them in to a different part of the enclosure, feed them, then go along the line of munching reindeer, naming them out loud: “Bumble, Clarinet, Enya, Orkney, Morven…” When I reach the end of the line I scan over the list of the reindeer who should be there and note the absentees – in this case four of the females. One of them we have already seen with her new calf, but we haven’t yet got her in to our “nursery” area of the enclosure. The others are potentially away to calve, or perhaps are just a little late in for breakfast! 6.15am: With the herd fed and content, I begin the walk round the enclosure. Everyone ends up with their own favoured route, but in general everyone begins by walking right up and round Silver Mount, the small mountain in the enclosure, before searching the woods. You can expect to be walking for about 2 hours, stopping to peer through binoculars at anything that could be a reindeer (so many reindeer-shaped rocks in this part of the country…). Today it’s already a glorious sunny day and I’ve soon taken off my jumper, but the weather isn’t always so kind – Fiona had the first early of the year in gale force winds and hail! Once I gain the height of the ridge, I spot two of the cows at different places in the woods, but no sign of the third one, so I carry on walking. Glorious views from the summit of Silver Mount, at 6.30am in the morning. 7.30am: I’ve almost completed my circuit, and haven’t found the third cow, but have had nice views of a cuckoo, tree pipits and a black grouse. 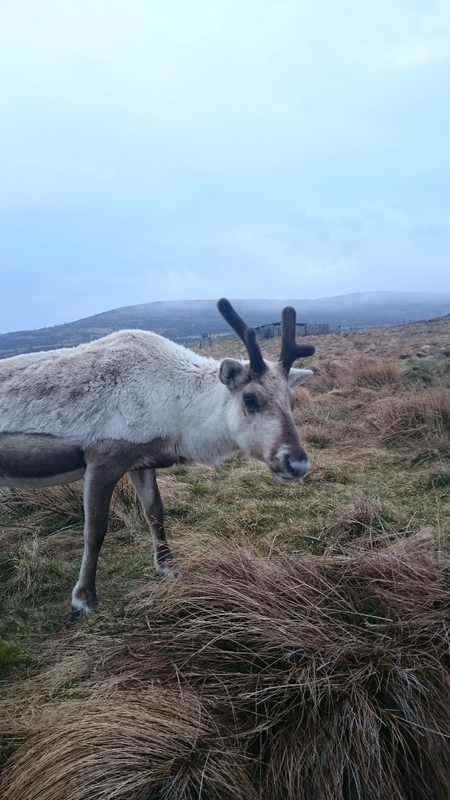 We’re lucky to have a huge amount of wildlife set up home within the enclosure, probably because its mostly free of people (apart from when we’re searching for reindeer!) and dogs. Last week there were even two osprey circling above, though I suspect they decided Black Loch was too small for their purposes! 7.45am: I reach one of the cows I’d spotted from the ridge. She stands up when I call to her and despite shaking a bag of food for her, she heads away from me purposefully. There is no calf following at her heels, but her behaviour suggests that she’s soon to give birth, so I leave her to it. Spot the reindeer! A lone cow is in the centre of the trees. 8am: I find the second cow that I’d spotted, but she is equally as keen to keep her distance, and sadly for me hasn’t calved yet either. Finding a newborn calf is always the highlight, and many of the females are just delighted to get some food, so are completely unconcerned by you checking the gender of the calf, spraying its navel and having a quick cuddle before leading them in to join the group of cows and calves. Some of the cows, however, do turn completely wild once they’ve calved, and won’t come anywhere near you – instinct kicking in to protect the vulnerable calf from any potential danger. Thankfully they tend to calm down after a couple of days. 8.15am: No new calves for me this morning, but I do have the task of getting in the female who calved a few days ago. She isn’t too far from the gateway that I need her to go through, but is in a flighty mood so it is a case of gently herding her in the right direction. 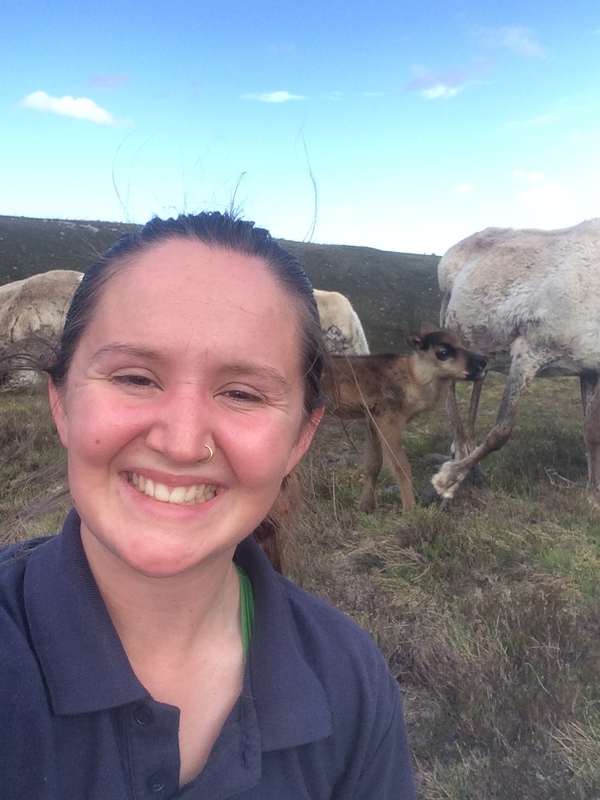 I’m lucky that she is happy to go the direction I’d like her to go, as there is no way I can outrun her two-day-old calf! Once through with the group of cows and calves, she immediately comes over for a pile of food – flight mode forgotten! 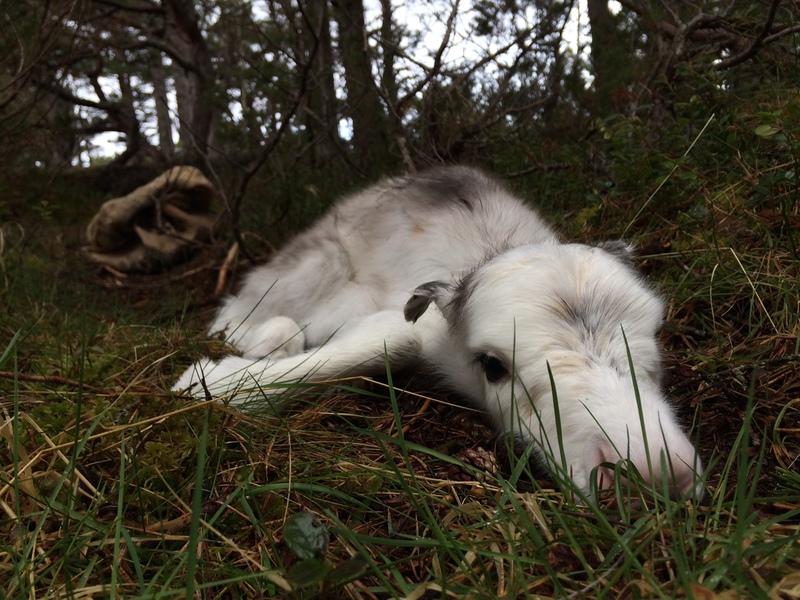 This is what you’re always hoping to find – a newborn bundle of calf! 9am: With the main herd let back out into the main enclosure, and everyone fed, it is time for me to head back down to the Centre. An unsuccessful morning in a way, with no new calves found and one cow successfully hiding from me (shows how massive the enclosure is! ), but when the sun is shining and all the reindeer are well, there’s no way I can begrudge the early start. Later that day Hen was the lucky one to find the first cow I’d come across with a newborn female calf. Maybe I’ll be treated to a newborn calf the next time!